Or view larger version. 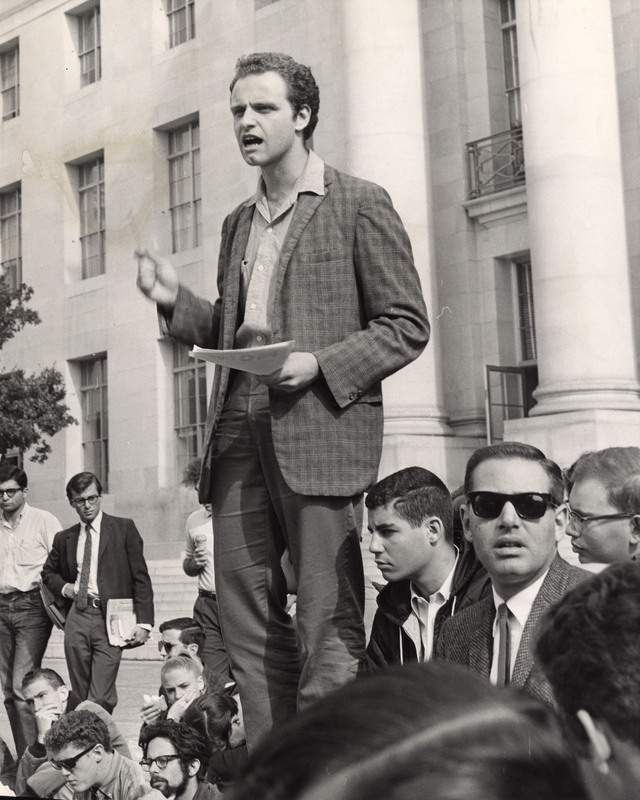 Mario Savio giving a speech to a group of students in front of Sproul Hall on the U.C. Berkeley campus. November 6, 1964. Tommy McDonough, photographer. Gelatin silver print. Collection of Oakland Museum of California. The Oakland Tribune Collection. Gift of Alameda Newspaper Group. This is a photograph of Mario Savio, leader of the Free Speech Movement. He is shown standing among a group of people giving a speech in front of Sproul Hall on the University of California, Berkeley campus. The Free Speech Movement was a student protest, which took place during the 1964-1965 academic year. In protests unprecedented at the time, students insisted that the university administration lift the ban of on-campus political activities and acknowledge the students' right to free speech and academic freedom.